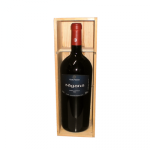 The Sagana is vinified from grapes Cusumano Nero d'Avola 100%. It looks like a dark ruby ​​colored wine with aromas of clove, violet, licorice and hints of dark tobacco. The taste reveals thick and soft, sustained by great freshness and elegant tannins. To combine mainly with guinea fowl and baked. Serve at 14 ° C.